As prices for high definition television finally begin to descend from the stratosphere, the question for many people this year - rather than whether to buy one - is which one to buy. That's not an easy question to answer because, along with many brands, there are many types of high-def technology from which to choose. There are high-def versions of traditional cathode ray tube sets, rear-screen projectors, front screen projection systems, plasma flat panels and LCD flat panels. As if that's not enough, you also have a choice of resolutions. The two most popular are 720p and 1080p. The numbers refer to the number of lines embedded within the signal. The higher number is better. But before you get too hung up on that point, consider two things. First, 720p is already spectacular compared to regular (standard definition) TVs and second, a 1080p set can only strut its stuff if it gets a 1080p signal. The vast majority of programs today are not available in that high a resolution and, unless you're one of the few people to have taken the plunge for either a Blu-ray or HD-DVD high-definition DVD player, your DVDs are not yet up to 720p, let alone 1080p. But even regular old DVDs look better on any high-definition TV. Size does matter but don't assume that bigger is necessarily better. If the size is too big relative to where you're sitting, the picture will look grainier than if you had a smaller set. A general rule of thumb is that the distance between the viewer and the screen should be between 1.5 and 2.5 times the diagonal size of the screen. So, if your couch is between 5 and 9 feet from the TV, you probably want about a 42-inch screen. If you're sitting 8 to 13 feet away, a 62-inch screen would be optimal. The higher the resolution, the closer you can get without seeing the imperfections, but there is still the risk of being so close to a big screen that you don't see the whole picture – kind of like being in the front row at a movie theater. If you had asked about getting a high-definition TV last holiday season, my advice would have been pretty simple. If you wanted a 37-inch or smaller set, I would have pointed you to LCD. If you wanted between 42 and 50 inches, I would have suggested plasma and for anything over 50, I would have pointed you to a rear-screen set using either LCOS (liquid crystal on silicon) or DLP (digital light processing) technology. I would have recommended (and still do suggest) a front screen projector only if you wanted to create a home theater-like atmosphere. And, unless you were going for a pretty small set, anything I would have recommended would have set you back at least $3,000. I also would have warned you that high-definition programming was somewhat hard to come by. But that was last year. This year I'm happy to report that all of the technologies (except perhaps CRTs) are getting cheaper and more affordable. LCDs are getting bigger and high-definition programming is more abundant. In other words, this might finally be the year that high-definition TVs go mainstream. High definition CRTs are still around but are probably the least attractive option for most users. If you're looking for a relatively small screen size and don't care about that bulky cabinet, you can get a nice picture. Still, with the price of other technology coming down, I think it's best for most people to pass on CRTs unless you're going for a very inexpensive standard definition set. LCD sets are coming on fast. Until this year, most affordable LCD screens were 37 inches (diagonally) or smaller because anything larger was generally too expensive for the consumer market. But efficiencies in production have changed the equation. Today you can get 42- and 46-inch LCD TVs and monitors for under $2,000. Plasma TVs have been the mainstream for high-definition for years because they provided a relatively affordable way to get a 42 inch or larger set. That's still somewhat true, but for sets 47 inches and below, plasma is beginning to be elbowed out by LCD. Plasma screens have a nice warm feeling and do a great job displaying very impressive high-definition images. They have a somewhat undeserved reputation of burning out over a period of time. It is true that a plasma TV will lose its luminance eventually but it's kind of a non-issue. Plasma sets are generally rated for a half-life of about 60,000 hours, which means it will take that long before the set loses half of its brightness. If you watch TV for six hours a day, that means a plasma set will be serviceable for 27 years. So, given a choice between plasma and LCD, which should you choose? If you're getting a 37-inch or smaller set, then it's definitely LCD and if you're going for more than 47 inches, then LCD – at least this year – is pretty much out of the question. If you're in the middle, then shop around. You'll probably find that LCD TVs look sharper and brighter and are less likely to reflect glare but you might find the overall picture quality of plasma to be warmer and more pleasing to the eye. Any high definition TV is great for game consoles, especially if you have a Sony Playstation 3 which comes with a high-definition Blu-Ray DVD player or an Xbox 360 which supports hi-definition games. Some gamers argue that plasma can create a temporary ghosting or image retention which does go away but can momentarily affect game play. Paul Gagnon, director of North American operations for DisplaySearch, a flat panel analyst firm, says that plasma might be slightly better for fast action sports but, he adds, "you can analyze TVs until your eyes bleed, but in the end, they're all going to be pretty close." I had a chance to test out the Westinghouse 47-inch LCD monitor (LVM-47w1), which is available online for about $2,000. One reason for the low price is that it's a monitor – not a TV. It doesn't have a tuner but it turns out that for many people that's OK because if you have a cable or satellite box, you don't need a tuner. I connected it to my HDTV cable box and was quite pleased with the results. The colors were clear. The blacks were a just slightly bit washed out compared to plasma but overall, the viewing experience was quite good. Speaking of things you don't need, most TVs and monitors come with speakers but for optimal sound, you want to connect your video source signal to a good 5.1 surround sound audio system. Sound makes an enormous difference, especially for movies. So if you don't already have a good sound system, consider investing in one along with your TV and don't worry about the TV's built-in sound system. If you're looking for a TV that's 52 inches or larger, then you have another choice: rear screen projection. These TVs have a light source at the rear of the box that projects an image to a translucent screen. From the front, they look pretty much the same as plasma and the image quality can be just as good. 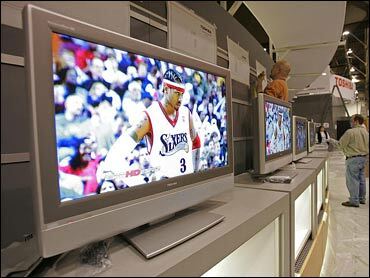 From the side, you notice that a rear-screen TV is much thicker – typically about 18 inches compared to about 3 to 4 inches for plasma or LCD. But that might not matter - if your room is big enough and if you have no plans to hang the TV on the wall. I borrowed a 56-inch JVC rear-screen (HD-56FH96) which currently sells for about $2,000. The quality of the picture is quite good - certainly comparable to plasma. JVC makes rear-screen sets from 52 to 61 inches using its own version of LCOS. I'm a big fan of buying online, but if you're going to spend hundreds or even thousands of dollars on a high-definition TV, you really should look at some before you buy. After looking at numerous sets, I can honestly say that the difference between them is often minimal and almost always at least somewhat subjective. What a reviewer says - yes, even this one - is just an opinion. In the end, the only opinion that matters is yours. So if this is your year for HDTV, get yourself down to the store, don't be afraid to ask questions, and don't worry: notes on what you need, for which room, etc., are allowed.